In this inspiring lecture, addressed primarily to the anthroposophic movement, Prokofieff gives an overview of how the spiritual hierarchies and Christ, the Lord of Karma, work in the ordering of human karma. 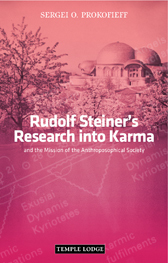 We are led to the karma and mission of the Anthroposophical Society, with indications as to what needs to happen before that karmic mission can be fulfilled. Prokofieff explains why true modern Christian research into karma does not arise out of intellectual speculation, curiosity or nebulous mystical experiences. The process of karmic research based on spiritual science should lead to a fundamental transformation of human nature, leading to a full experience of the cosmos.